I get asked a lot what the pitfalls of bathroom design are for designer’s who are just starting out in the business and I would have to say that bathrooms and kitchens are by far the hardest if they have never experienced renovating their own or a friend’s first! Kitchen’s are a whole other ballpark and come with many, many opportunities for mistakes for the unwitting, fresh designer, so I thought I would start with bathrooms as we could fit this into one blog post! Walls – This is possibly the trickiest thing to consider when undertaking a bathroom renovation or design as the first thing to consider is how much space you have for finishes! If the architraves are staying (as they will most likely do in a low cost or budget renovation), then you will need to measure how deep they are so that you can design around the doors and windows. Floors – Next, unless you want a “lovely” toe scratching metal bar or even worse, a toe breaking step up into the bathroom, you will need to understand what the juxtaposing floor finish is going to be (or is) and how deep that is too. Whilst you’re at it, if your client hasn’t got a big budget to ask the carpenter to cut the door to fit your 30mm stone flooring, then you might want to measure how much gap you have under the door too, just to make sure you know how much space you have to play with. Ceiling – If you can’t measure the void within the ceiling or can’t photograph it, then think about whether the property is a flat and what floor it is on. You may need to consider fire-hoods / casing and some LED lighting will have large heat diffusing backs and or may require transformers in an accessible place, close to the lights themselves. Don’t forget that bathroom lighting in Zones 1 and 2 needs to be IP44 rated minimum (Zone one is the area in the bath, shower or around the sink and Zone 2 is the area around those areas up to about 60cm – which is more of a splash zone). Just as a rule of thumb, I would look at the thickness of what I am proposing (the depth of the tile or stone) and then know that I will probably need around the same amount of space behind the tile to fix it in place. Usually, a 3mm tile can get away with a much thinner bed, but a 20mm piece of stone will need at least 10mm bed with at least a cementitious board that can carry the weight of the stone. Don’t forget that not all wall tiles can be used on the floor either. Ceramic tiles which are usually cheaper will usually be only for the walls as they are much softer than porcelain tiles or stone, so always check before making your final decision on your finishes. The key with bathrooms, however, is looking at where the riser is. You’ll spot it easily in an older building as it will probably be boxed out, but in a new building, it will most likely be concealed slightly better (you’d hope). The toilet is usually positioned pretty close to it, so that is your first give away. Moving a toilet or shower around the riser is usually not too much of a problem because the proximity to the connection is the key. As a rule of thumb, a shower waste will be around 50mm and a toilet waste pipe will be around 110mm in diameter and they require a fall to the riser of 1:60 (that’s 1 meter in height for every 60m in length – or about 2cm drop per meter. That doesn’t sound like much, but considering the floor depth is usually around 250mm, then you start to encroach on the ceiling below if moving it more than a couple of meters. Ah, the joy! Just when you find the perfect shower in the right finish, you can’t match the mixer, or just when you find the perfect set for everything it doesn’t have WRAS approval. This can be a minefield and unless working on super low-cost projects are often best dealt with a contact or supplier from a specific company. There are so many parts and mechanisms that go along with and need to be ordered to fit a shower or tap that it is best to work alongside someone who knows their stock. This is the kind of thing you don’t really want to leave to your plumber. Low-cost projects usually do and that is where you start to get mismatched items or showers not working well. If you know it, you will also need to know the pressure you currently have and the type of system in your property. A gravity led system has much less pressure than mains pressure and you may need to also install pressure reducing valves (for the designer that means fitting more things in behind the already full walls or hiding more stuff or trying to box it in). What I’m trying to say is that choosing a shower head and matching mixer is not as simple as matching the style to the mixer on the basin. There are a lot of things that are needed to be considered alongside the items themselves to make sure they work correctly once installed. Add to this water reducing filters and water saving devices you have to really know what items will work to give you the desired end result. The type of boiler and hot water installation (ie mains or gravity pressure). Water saving or regulatory requirements (usually only for new builds or historic projects) or any unique property specific requirements. Which direction the floor and ceiling joists run (if timber construction) and where the wall studs are. And just one final note, don’t expect to be able to use an external wall depth to add to the room you have. External walls should not be messed with, especially in new construction where any penetration could affect the airtightness or vapour control of the building. As a general rule, if you want to hide some piping in an external wall, you will need to build a new wall or boxing in front of it so that you don’t damage the external envelope of the building which could cause damp or allow vermin into the walls. Refurbishments are where most of the big mistakes happen because the initial build is tightly controlled but small or minor works in between aren’t usually monitored and often done by uneducated homeowners, on the cheap or in a DIY way. Buildings are getting more complicated and there are more things that can be damaged than just a bit of mould getting through a wall. Partitions, floors and ceilings all act as fire compartmentalization so some alterations, if not completed by a competent person who knows the local laws may be unknowingly creating a dangerous situation. The most asked question that I get as an interior design mentor is how do interior designer’s get clients, and the next in line is how do I run an interior design project? The biggest problem I see for start-up interior design businesses is the way they attempt to run a project is the standard way we were all taught. This is the same way projects have been run for years and honestly it’s quite outdated! The biggest mistake I see even professional and established interior designers make when running a project is that they run every single project in the same way. In that, I mean they always use the traditional large interior design project management process. Having run over a hundred projects now, I can tell you that that process is absolutely perfect, tried and tested on large, traditional interior design projects, especially ones that are over £60K. Unfortunately the majority of projects that start-up interior designers are working on are well under that figure and so this process doesn’t work, but unfortunately, it is still the only process being taught around the world in interior design schools. The reason why I focus on start-up interior design businesses is because they have to deal with specific issues that established businesses don’t really have to deal with. Those issues, however usually span across at least the first 1-2 years of a startup interior designer’s career and are what will ultimately make his or her success (or failure). These are the hardest times any business goes through, let alone an interior design business and it doesn’t help that professional and recognised schools are teaching us to run projects in ways that just aren’t relevant for a small business. 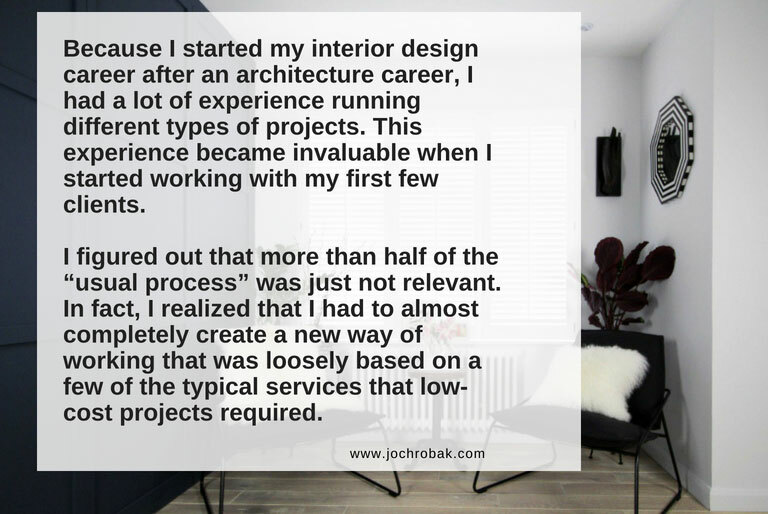 Because I started my interior design career after an architecture career, I had a lot of experience running different types of projects. This experience became invaluable to me when I started working with my first small interior design projects. I figured out that more than half of the “usual process” was just not relevant. In fact, I realized that I had to almost completely create a new way of working that was loosely based on a few of the typical services that low-cost projects required. Many established interior designers just won’t understand this as the route they are using is perfectly fine for large or lucrative projects, however, these smaller projects often don’t require things like custom furniture design, detail design, turnkey styling, purchasing or construction information. Help with communicating to trades (often these are just painters, decorators, handymen, electricians, furniture painters, upholsterers, plumbers or carpenters). Sometimes, if they have the skills the interior designer could potentially project manage the project (although I strongly recommend they don’t as the risk of making a big mistake especially with trades at the early stages is too high). As you can see, the services that small projects offer are more consulting services rather than supplying of products alongside project management. The typical large project route is completely different and just too complicated for a small project with lots of unnecessary parts that just don’t make sense. Commercial projects whether large or small will also be fairly different especially because the interior designer is usually part of a larger consultant team and so again the standard project route isn’t really relevant as the interior designer’s specific project requirements are often negotiated separately for each individual project. So although it is critical to understand the formal traditional interior design project route, the reality is that this is just too complicated for the majority of projects that startups are working on. No wonder I see so many confused interior design graduates who just don’t know how to run their first few projects, because the things they have been taught, just simply don’t apply to their projects. I see them buying wordy, unnecessary legal contracts and trying to negotiate FF&E terms and conditions that just aren’t relevant. So how do you run an interior design project? Make sure you have a clear brief, agreement and terms and conditions in place. Deliver what was agreed in the agreement. Then make sure the client (not you) takes the responsibility for most of the tradesmen and purchasing. The client basically pays for the information/designs but does the physical or purchasing work themselves. This is unlike a large project where the client is paying a large sum for the interior designer to do pretty much everything; from purchasing, dealing with deliveries and also at times ironing the sheets for the styling shoot! I know that there are many who disagree with this and I just wanted to make an additional point here as I have seen a lot of surprising negative comments about online and low-cost interior design services, possibly because they feel threatened that these new, wonderful and fresh interior designers are fishing in their ponds, but the reality is that these new designers are fishing in totally different ponds altogether, so they needn’t be afraid of increased competition! The internet has opened up a completely new market for interior designers and those projects are wonderful because they are helping people who could never in their lives have afforded an interior designer but are still willing to invest into a professional consultant who can help them with minor issues that make a huge difference to their lives. And there is no better way for an interior designer who is just starting out to get real-life experience than to provide life-changing solutions and services to those who really appreciate it! If you enjoyed reading this blog post pretty please would you vote for it as I have been nominated for an award HERE. I have found myself repeating this to my mentees and I realize it is something I am quite passionate about. For me, being a designer is a lifestyle. Ok, I understand and am totally cool with being an archi-nerd that takes everything I do a little too seriously, however, I think you need a little crazy passion for what you do in order to really have the drive as a designer and business owner to keep yourself going in the design industry. So why is being an interior designer a lifestyle? Well in part I think it needs to be because there really aren’t enough hours in the day to do our awesome job as well as soak up and keep learning new information. Also, as design is not only our profession but also our passion, we are constantly on the lookout to learn more and have more fun (calling it work ha ha). When I worked at architects offices and my mates went out for drinks, I would stay back at work so that I could take a couple of hours off to go to a trade show the next day. When everyone else was out at lunch, I was reading the latest interior design and architecture magazines and adding to my knowledge during my lunch breaks. It wasn’t forced, I wanted to do it, in fact I am so obsessed with design that when I wasn’t working, I found myself working just because I loved it. Now as a business owner I can spread things out a little more as I am in control, but if I had a choice I would be engulfed by my design world at all times. Even if I am one extreme, I do believe that there are elements of this that those who are wanting to get into interior design can start including into their lives in order to maximize the learning time and speed up their success. In order to stay abreast of the industry and know what is current and what is coming up, you need to be constantly exploring showrooms, manufacturers and speaking with people. This means you need to make time to go to trade shows make connections and network continuously. There are so many trade shows each year, now I choose which ones I want to go to at the beginning of the year and book my tickets early. It would be a full-time job alone attending these trade shows, so in order to even make a few each year, you need to include it into your lifestyle as employers in the industry rarely allow you to go to these important events during their work time (even if it is “work-related”). Continuously learning and growing my knowledge about art, architecture, building materials, furniture and design is something I include into my “free” time. I’m lucky my husband is arty too because it means we can have a critical conversation about an artist or artwork which explores theories and opens our eyes to new possibilities and themes. Going to a museum on the weekend or popping into a gallery to get inspiration or learn something new is not only fun but helps you to gain knowledge in the industry in a different way. Often our clients are educated and being able to connect with them and understand why they appreciate a particular style is critical to the work we do and to our success in our profession. The first holidays I ever went on by myself were to Europe (from Australia). I needed to see those cities. I needed to experience their vibe and understand their energy. There are things that you cannot learn from books like the experience of sitting in an Italian Piazza drinking a hot espresso on a hot Italian summers day, surrounded by marble and high calibre design. As an Aussie these places were so foreign to me I just didn’t get it. Now I do, now I can relate and now I know how imperative it is to immerse myself in new cultures and get hungry to learn and explore the essence of a new place. This makes me a better designer, it helps me relate and it teaches me that creating spaces is more than just paint and surfaces, it’s about atmosphere and invigorating all of the senses. When I moved out of London to a dull suburb town, I realized how much this affected my wellbeing. It’s not that everything around me has to be beautiful but seeking the beauty in things is an innate need we have as designers and so we not only gravitate towards funky, cool or beautiful spaces, we need them in order to refuel our souls and get inspiration. This means yes, you’ll find us probably in the coolest looking café in the street where we are paying an extra £2 per coffee, but the experience for us is worth it. That is life for a designer, it’s our life juice and our creative outlet. So while there are those out there that can put up with mediocre surroundings, we are imagining new and amazing places for others who appreciate spaces for self-expression and creative re-fueling. There is a reason why we are constantly making everything beautiful wherever we go (even if it’s just in our heads). For me (and also for some of my mentees) the definition of insanity is being somewhere else in your mind whilst physically being in a job that is unfulfilling and uses zero creativity. We yearn for the creative release because it is part of our personalities and soul. That is why we can’t separate it from our daily lives and that is why design becomes our lifestyle. We seek it out in everything we do. Most people who think about what an interior designer does, think that interior designers only design high-end luxury properties or hotel interiors for lucrative projects. This is pretty outdated thinking and in recent years the requirement for interior design has actually increased and has also become more accessible to the mass market. HGTV and home renovation shows are hugely popular and have created a culture around the idea that everyone can give interior design a go. That is great because it has increased the interest in one of the most fun and lucrative industries to work in. The reality, however, is that designing the interior of a home (and even a commercial property) can actually be quite difficult, let alone running a bigger project and staying within budget! That is why the average homeowner and renter have started to seek out the services of online interior designers who can provide a fast, low cost and efficient service that saves them time and money to get a result that usually far exceeds their expectations. You see design for some of us is easy, whereas for others it’s actually really hard. That can be difficult to comprehend when you wonder how anyone wouldn’t want to do this interior design thing themselves! I have clients who come to me who absolutely love interior design, but they just can’t do it themselves and really need guidance. I also have clients from the other side of the spectrum, where they have exquisite taste (probably better than mine!) and they need me to do the work for them as they don’t have time for sourcing or project management on a project of theirs. 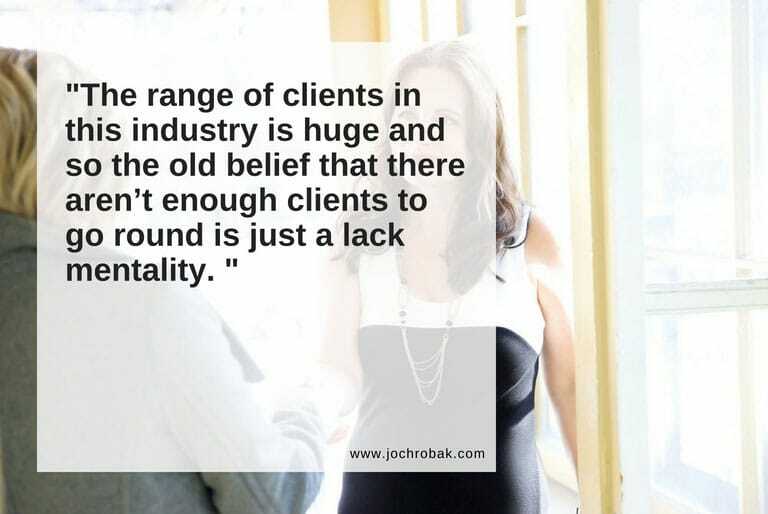 The range of clients in this industry is huge and so the old belief that there aren’t enough clients to go round is just a lack mentality. The design industry I have been a part of over the last 20 years has been secretive, bitchy and horrible, but I decided about 5 years ago that I was no longer going to be a part of that secret handshake club and that I was going to create a new, joyful and supportive society that shares information and helps the designers, rather than punishes and isolates them. As a business owner and interior designer, continually searching for new clients is time and energy consuming. You don’t want to be spending 70% of your time each week trying to find your next client or chasing leads. You want to be spending 70% of your time doing the job you love. The key to getting consistent income as an interior designer is to be consistently marketing. Another avenue is to get repeat clients through a professional relationship. I believe that interior designer’s especially at the beginning of their business should make a real effort to have one regular and consistent stream of income or guaranteed money source from an established business that can refer either regular clients your way each month or who refers work to you as a contractor regularly each month or every few months. Having more than one stream of income as an interior designer and a business owner is a much safer way to run a business and helps you get peace of mind when one avenue in your business is slow during one time in the year. For example, most of the building industry is slow over Christmas, and many larger clients go away over the summer, but your business still needs cash flow during those times. I urge you to find at least 2 regular sources of income in your business and don’t stop until you find them. You want to set your business up for success and playing the luck game or spending hundreds per month on advertising is plain silly! I never once got a client through paid advertising and to this day still don’t advertise for clients in the interior design and architectural side of my business! Professionals in the building Industry – Architects, engineers, draftsmen and technicians. Wardrobe or kitchen design companies – Design service or complimentary service for their customers. If you are trying to set up an interior design business or if you are considering transitioning into this career, I can help you do it the right way so that you avoid costly mistakes, speed up your success and help you to make that dream a profitable reality. Check out my Interior Designer’s Business School. How much does it cost to start an Interior Design Business? By the time I started my business I had invested in two degrees, postgraduate courses, business coaching and probably close to another hundred extra programs and courses to grow my knowledge, not to mention that I read at least one non-fiction book a month for the past 10 years! I used to believe that running a business was hard, needed a large investment of funds and that I needed to hire full-time staff in order to succeed. When I run my mentorship program for interior design start-ups I show them that setting up an interior design business can be done for free. Yes if you choose to invest in particular areas, it is your choice, but there is no reason why you can’t set up your business, start trading, market and get clients without investing anything at all. Don’t believe me? Interior design requires little, if any investment. Setting up trade relationships are one of the key elements of an interior designer, but this doesn’t cost anything except some negotiating and networking. The better deals that you can find for your clients, the more chance you have of attracting a steady stream of income from excited clients who are ready to get great deals on their perfect items. Choosing a color palette and mood board is easy and free, (although it does require some technical knowledge). You just need to use that creative energy you have – but that’s the whole point about loving interior design. Also with the growing number of royalty-free imagery for commercial use, there is a wealth of high quality free interior design related images to source and use. With thousands of home décor related websites dedicated to helping DIYers freely available for marketing your services, there are endless opportunities to market your services online (or in person) without any fees. Websites can be built for free, get free publicity and you can even advertise for free! One of the most important things an interior designer does is listen to her clients. These days, for many of us, holding a virtual meeting is second nature and doesn’t require any investment or much technical knowledge, although if you want to do it the old fashioned way you can! There is a lot of creativity required for the visual presentation part of the process for an interior design service, however, designer’s are no longer limited to purchasing expensive software to present their ideas as they did in the past. These days, there are thousands of free programs that can be used for the first few years of your start-up without having to invest large amounts of money into expensive subscriptions. There is no need to register a company or business name if you are working for yourself. As long as you inform the tax department that you are starting to provide freelance interior design services (or interior décor design in some areas of the USA) there is no fee associated with starting your business and with the right knowledge, you could start freelancing pretty much, straight away. I stared about 4 businesses before I finally started my architectural and interior design business. Ironically the thing that held me back were the “unforeseen start up costs” that didn’t actually exist. If only I had known back then that there is always a way to do it for free, I would have started sooner, rather than let fear hold me back from running my dream business. Assuming that the majority of us already have a computer and an internet connection there is no reason why you can’t start working and earning a living as a self-employed interior designer with zero start up costs. If you are serious about a career in interior design or if you are feeling called to work in this industry my interior designer’s business school mentorship program is for you. Click here to find out more. 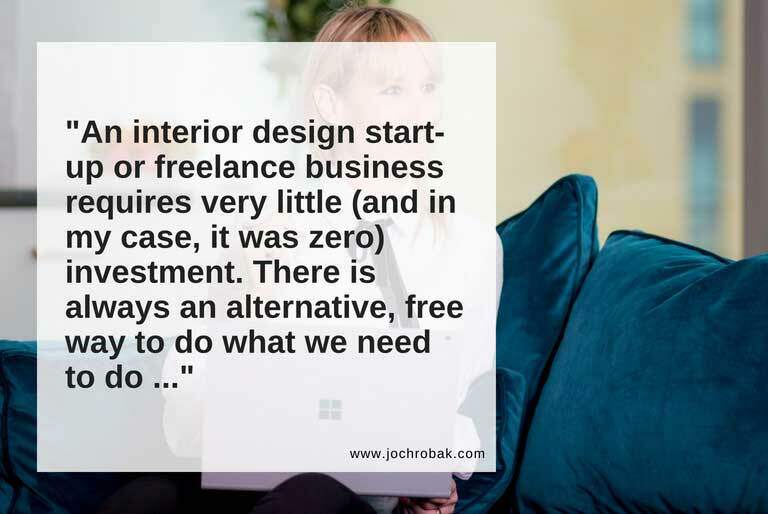 https://www.jochrobak.com/wp-content/uploads/2018/06/How-much-does-it-cost-to-start-an-Interior-Design-Business-Jo-Chrobak.jpg 514 768 Jo https://www.jochrobak.com/wp-content/uploads/2018/01/IDC.jpg Jo2018-06-22 08:29:532018-08-26 17:52:24How much does it cost to start an Interior Design Business? Is it hard to become an interior designer? How can I become an interior designer? Well everyone will tell you that you should go do a course and then go and get experience. WRONG! There are a few very key reasons why it is too hard to become an interior designer the traditional way, which is – going to get a formal education at an institution then applying for a job when you graduate. I probably get 1-3 enquires per month from graduates or interior designers looking for work, most of them, quite talented, working in cafes or other industries, but not employable by me in either the commercial or domestic part of my business. The most common path if you want to become an interior designer is to go to university or college and study interior design, some drafting, contract administration, project management, furniture, art and architectural history and most importantly design. The second reason is that, business owners have more often than not, spent hundreds and thousands of pounds on training, years of study, hard work and dedication and they are afraid to pass on too much information to staff who will most definitely leave as soon as they become profitable for them. So why don’t universities teach students what they need to know in order to get employed? The truth is they do try, but universities are not set up to provide that kind of education. The industry has been criticized for years that graduates are entering the workforce without the required knowledge and are therefore unemployable. The skills that a real life office needs are practical skills and unfortunately tertiary education provides theoretical education rather than real-life skills. There are large firms who will usually take on graduates, however not everyone wants to work in the commercial sector, and still this doesn’t provide the right experience for everyone. Anyone who has worked in both the commercial and domestic sectors in architecture, construction and interiors will know what I am talking about. The domestic and commercial sectors are VERY DIFFERENT INDUSTRIES, in fact, completely different. I have worked with designers from the commercial sector who can transfer their knowledge into the domestic market, but they do drop considerably when it comes to design skill and technical knowledge and vice-versa. So the traditional route requires you to spend a lot of money on getting an education (which is actually pretty fun, I did it for 7 years and thought I would be an eternal student), but then you graduate and you find that you can’t find work because everyone requires the one thing you don’t learn at university, which happens to be the key thing to getting employment….experience. I was lucky enough to get experience while I was at university. My bestie and I opened up our first architecture firm whilst still at uni. We had 3 projects that we ran together. I believe the main reason I never had problems finding work was because I had real experience when I graduated. So the typical thing that happens is students graduate thinking, finally, my dream career just to be told, “I’m sorry, we would like you to have some more experience”….. what?! And so it goes… on and on until you give up on your dream career. In Australia, we have this thing called TAFE. I remember you could go and get a trade or learn practical skills instead of going to uni in pretty much any career. The idea was that you would attend lessons a couple of evenings after work each week, whilst also working full time as an apprentice. In my opinion, this model would suit the interior design industry much better than going to get a formal education, because the reality is that practical experience is how most of us learn in this industry. I am really passionate about helping people start a career in interior design. I found that the interior designers I knew from working in the industry, were not people I actually wanted to work for either… Why were they always so erratic and crazy-like? And I don’t feel that these are the right role models to future leaders in the industry. 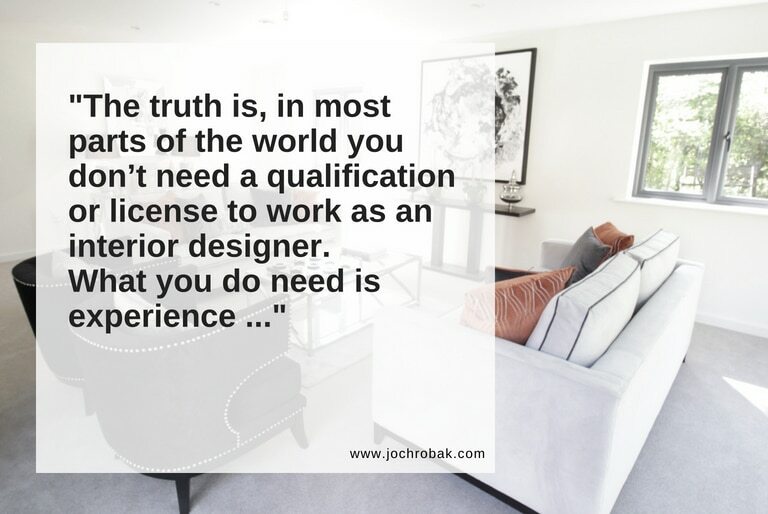 The truth is, in most parts of the world including the UK, Australia, Europe, Asia, Africa and many states in the USA, you don’t need a formal education, qualification or even a license to call yourself or work as an interior designer. And, in fact, what you do need to get work is experience. So why not get experience on your own projects, whilst earning money and working in the industry at the same time? It makes sense to me! You can do that with my mentorship program. You don’t need to have any previous experience working in the industry, but you do need a level of competency, which you should already have if you are transferring from another career or already have a degree in interiors or any other industry. Click here to find out when the next round starts. 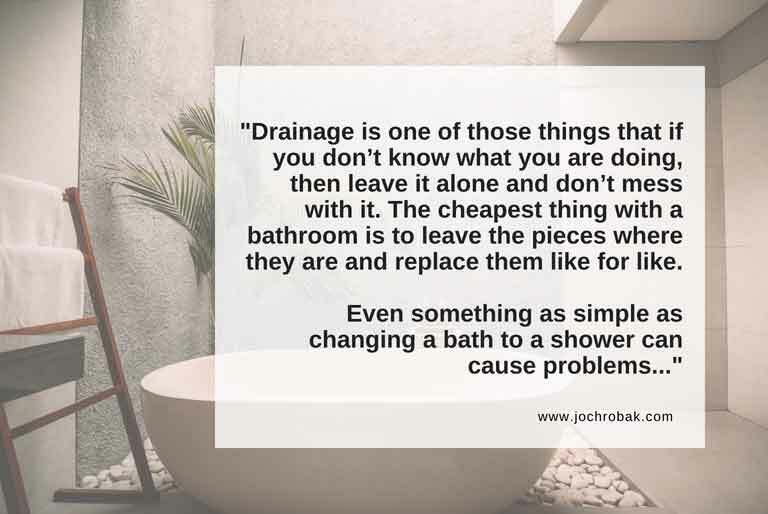 https://www.jochrobak.com/wp-content/uploads/2018/06/Is-it-hard-to-become-an-interior-designer_.jpg 514 768 Jo https://www.jochrobak.com/wp-content/uploads/2018/01/IDC.jpg Jo2018-06-12 09:11:062018-08-26 17:53:11Is it hard to become an interior designer? Can I become an Interior designer in 3 months? The interior design world is full of people who will say no to the above question. But the biggest criticism the workplace world gives design schools is that they send out graduates with little practical knowledge, which means that many graduates still need work experience before they are truly employable. Having been one of those graduates many years ago and now being on the hiring end of the line, I can tell you that I have never hired a design graduate. Instead, I have been hiring people who are transferring from other fields, who have a passion for interiors, have experience in something else but really want to be doing this. I found out quite early on that passion, drive, commitment, loyalty and maturity are far more important qualities to me as an employer and someone who wants to learn is much more of a pleasure to work with. You might be surprised to know that in most countries, including Australia, New Zealand, The United Kingdom and some states in the USA, you don’t need a formal education, qualification, experience or license to call yourself or work as a domestic interior designer. (Commercial interiors are a little different, I will write about that another time). Although without some kind of education or experience you really wouldn’t know what you were doing because there are certain things that you do as an interior designer that you just wouldn’t know about unless you had been taught or had some experience. But the reality is that being an interior designer isn’t actually that difficult, but many snobby designers will tell you differently! Sometimes, I can’t believe that I get paid to do what I do, I love it so much, and I’m not the only one. Most interior designers are absolutely obsessed with interior design. They do it for work; they do it as a hobby, they read about it in their spare time, they dream about it, talk about it, live it, breath it, eat it, smell it (you get my point). So could you become an interior designer in 3 months? In my opinion with the right knowledge, you could start working in the domestic market, yes! So what would you be doing as a domestic interior designer? Some of the typical things that I do for clients include; drawing and providing layout options for rooms, designing and presenting how spaces will look, sourcing, choosing and purchasing furniture, finishes and fittings, designing lighting, joinery, furniture, wardrobes, coordinating audiovisual & TV walls, coordinating with builders, carpenters and electricians, choosing soft furnishings for curtain makers, drawing and presenting designs, running a project on site and lots, lots more. Not every project requires all of the above and to be honest, the majority of smaller projects, just need colour, mood boards, well-designed furniture layouts, some creativity and a plan of execution (procurement method). What I’m finding these days is that the average person buying a property is ready to hire an interior designer to help create their dream home and they just want someone that they connect with and understands what it is they need. Having worked with over 30 happy (and paying) clients in my first year of business, I can tell you that you can become an interior designer in 3 months. You just need the right information, and it just depends on where you want to practice, how dedicated you are to your career and what kind of work you want to do. https://www.jochrobak.com/wp-content/uploads/2018/02/interior-design-course.jpg 514 768 Jo https://www.jochrobak.com/wp-content/uploads/2018/01/IDC.jpg Jo2018-02-13 08:46:292018-07-04 08:35:57Can I become an Interior designer in 3 months? 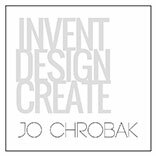 Invent Design Create Limited trading as Jo Chrobak is a registered company in England and Wales UK.